[Friend]: Really? Are you on a diet? [Parisian Woman]: No, I keep failing. [Friend]: Are you working out? [Parisian Woman]: Nope. I don't have time. [Friend]: So what are you doing about it? -The denim sale at Saks. It's up to $150 off using code DENIM15. It's $25 off $150, $75 off $300 and $150 off $500. If you've been craving a pair of premium denim, it's a good time to put your hands on it :P This one, this one and this one are all great choices. Sale ends tomorrow. -The second sale is Kate Spade Saturday, which has 40% off on everything including sale items use code EXTRA40. These boots, the mule and their signature A Satchel are all 40% off. These are the best discounts I've seen them offer. Such a beautiful, effortlessly chic ensemble! Great outfit! Love the bag!! Ha! This made me laugh!! I absolutely love this look!! Perfect outfit. Love this classic look! 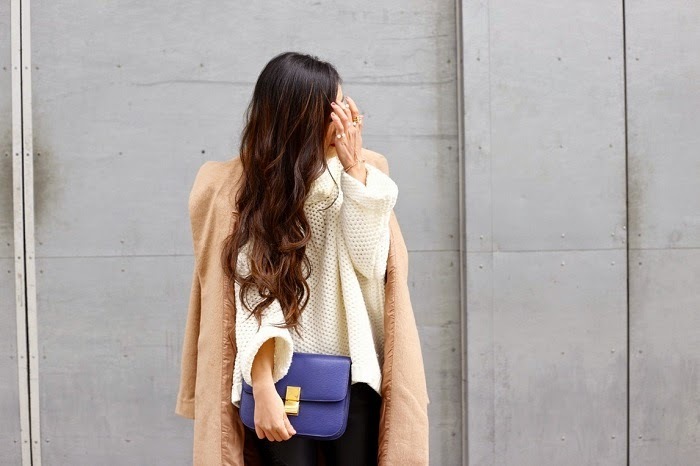 Obsessed with your sweater and that gorgeous camel coat is such a great closet staple and a steel too. I'm having serious bag envy over here! That bag is practically the last one left I've got to add to my collection! You look fantastic hun! you look stunning! beautiful outfit! You are beautiful! I love this outfit so much! !